Welcome sign at the front of the Mary Condon Hodgson Art Gallery at Frederick Community College. 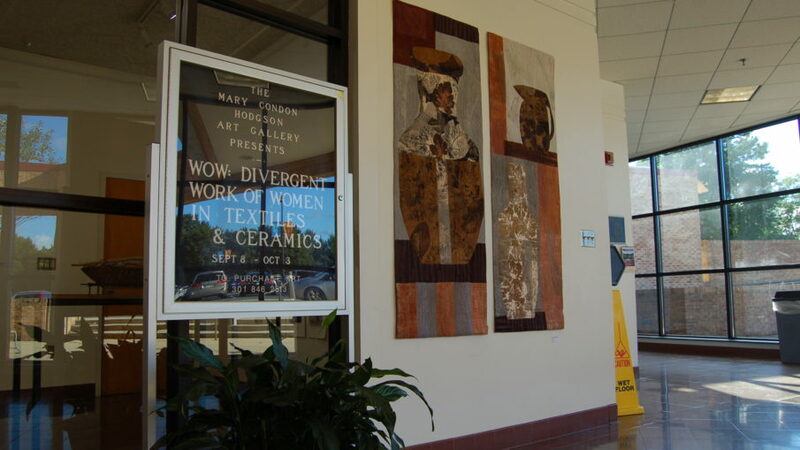 “WOW: Divergent Work of Women in Textiles and Ceramics” is the current exhibit showcased in the Mary Condon Hodgson Gallery located within the Visual and Performing Arts Building at Frederick Community College. The exhibition features six diverse female artists from the Frederick and DC metro area, and runs through October 3rd. From quilting to pottery, this exhibit ties together multiple mediums, relishing in “the harmony in the variety,” according to Wendall Poindexter, the art program manager. FCC adjunct art professor Margaret Hluch is the curator of the exhibit and said she chose the mediums used in this exhibit to expand visuality of art forms that are not always focused on. 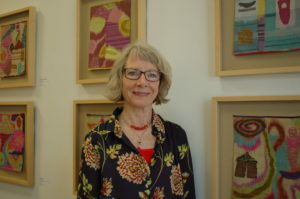 Mary Hluch, adjunct professor, featured artist, and curator of the exhibit stands in front of a couple of her displayed works in the Mary Condon Hodgson Art Gallery at Frederick Community College. Textiles in particular is a medium that Hluch sought to spotlight. While many classes and workshops are held for ceramics throughout the year, on and off the FCC campus, it is a much harder task to find options regarding textiles, which makes it seem like an unlikely option for prospective artists. 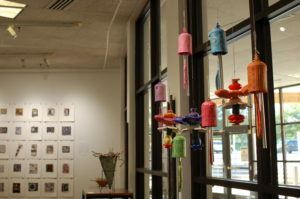 A ceramic display individually entitled “Purple Garden Bell, Hanging Red Butterfly Stach, Green Garden Bell, Pink Garden Bell, Red Hanging Bell, Blue Butterfly Stach, Blue Garden Bell, Orange Hanging Butterfly Stach, and Orange Garden Bell” by Laura Silberman in the Mary Condon Hodgson Art Gallery at Frederick Community College. Hluch is an experienced textile artist but teaches 2D art,design, and color theory at FCC. 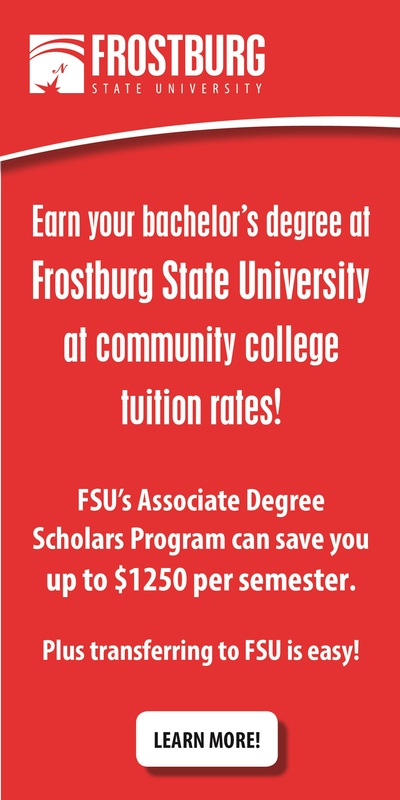 The college does not currently offer classes on textiles, but Hluch recommends a shop called The Muse in downtown Frederick. Hluch occasionally teaches workshops for aspiring artists who wish to gain experience in the medium. The Muse, which is owned by Whitney Dahlberg, one of the featured artists, holds many classes and workshops throughout the year in various mediums, including textiles. For the inexperienced eye, Hluch warns away from attempting to figure out how each piece is made, and to instead focus on finding an aspect of each piece that “speaks to you.” From color, to texture, to writing, to even the title, there is something powerful within everything displayed that will draw the viewer in. 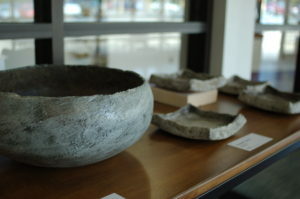 The ceramic piece entitled “Large White Bowl” by Meg Dickerson in the Mary Condon Hodgson Art Gallery at Frederick Community College. The exhibit focuses strongly on the uniqueness of the mediums and the diversity each artist brings to the field. Each piece is vastly different, but there’s a strong emphasis on the cohesion within the pieces and the exhibit itself. “One might think it’s the work of one artist instead of six from the way it harmonizes,” says Poindexter. Contributors are textile artists Whitney Dahlberg, Dominie Nash, and Margaret Hluch, and ceramic artists Meg Dickerson, Laura Silberman, and Stacy Snyder.